This famous German surname can be either locational or topgraphical. 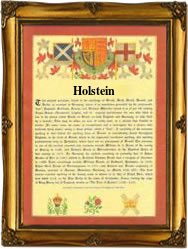 Of pre medieval origins, it is either a name of nobility and associated with the former Grand Duchy of Schleswig-Holstein, or it may be from one of the three German places called Holstein. If topographical the origin is from the word "holsten", and as such it describes a forest, or specifically a forest dweller. Locational surnames are usually "from" names. That is to say names given to people as easy forms of identification, after they left their original homes and moved somewhere else. That could be the next village, or far away in some capital city, the same principle applied. The British royal family are linked with the dukedom of Schleswig-Holstein through the marriage of Princess Victoria to Czar Wilhelm 11 of Germany. In surviving German rolls and charters the Holstein surname is first recorded in a diminutive form as Holsteinin in the year 1382, when one Emmely Holsteinin zu Freiburg appears in the charters of that city. Schleswig, the name means muddy place or similar, is nearly two centuries earlier, with Bernhard Schleichwegg being recorded at Biberach, in 1192. In England the name may be a Huguenot refugee name. The first recording may be John Holstein, a witness at the famous church of St Dunstans in the East, Stepney, on September 16th 1744.